Update 6/2/2011: I added 3 photos at the bottom. I already told you that I live in Vizcaya. 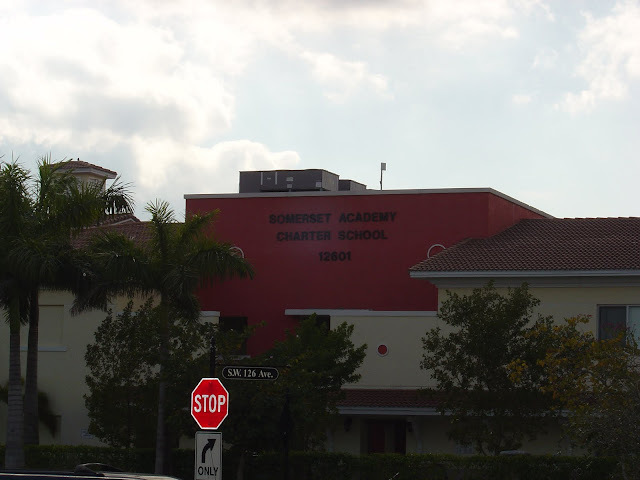 Near the entrance to the Vizcaya communities (on Flamingo just north of Honey Hill Drive) sits Somerset Academy Miramar Charter School. (I know the picture isn't great; that stop sign grabbed all the attention!) 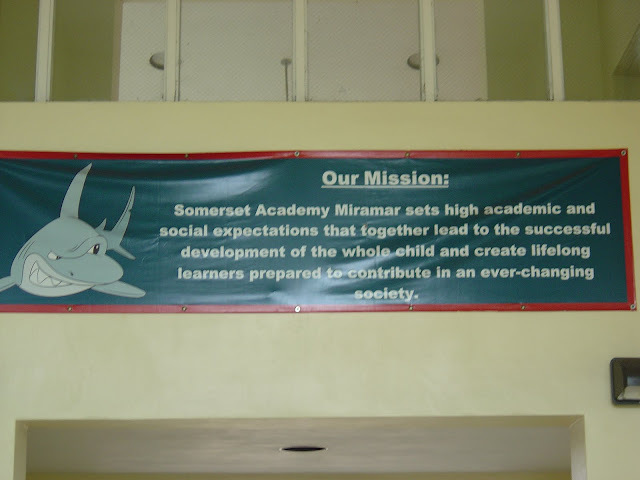 This is a relatively new school, in just its third year of existence. There was for many years the Neighborhood School across the street, which was basically just a converted house that could only handle a few dozen students. Now, that is used for Pre-K and K children before they move over to the big school in First Grade. My son has been in the big school for two years now, and I am very pleased with the education he is receiving, the discipline that is being administered, the communication, the aftercare program, everything. Mrs. Shannine Sadesky-Hunt, the school's principal, is a very nice woman and seems to know every single kid's name (and the parents that go with each kid). Besides being nice, she seems to not take any flack from the students and is well-respected for it. If you're looking for a great school, check this place out! This is their posted mission inside the school and a banner showing that they are the Sharks! Watch out Jaws! Here are some photos I took tonight, 6/2/2011, after the science fair. They are so awesome even the grass grows with a shark logo!